1. The 2010 Critérium du Dauphiné concluded yesterday with Slovenain Janez Brajkovic taking Radio Shack’s first big win of the season—and perhaps more importantly, he did it by beating Astana’s Alberto Contador. Although Brajkovic’s been a professional for 5 seasons, he’s only 26-years old—his best years are clearly still ahead of him. He won the race in textbook fashion: a top-5 prologue followed by a win in the ITT and a successful defense of the leader’s jersey in the mountains. Lance must be proud. Here’s my question: does Armstrong have cause to worry that his younger teammate might steal his thunder come July? 2. As for Contador, he’s right on schedule for a successful defense of his Tour title next month. Some are trying to cast doubt on the Spaniard’s fitness, but I think he’s right where he needs to be in order to peak for the Tour’s second and third weeks. Better still, his team seems to be rising to the occasion as well. At times during several of the race’s tougher moments, Contador had two or three teammates with him compared to Brajkovic’s one or two. With another two or three weeks of good hard training and some time to grow more accustomed to his new TT bike, Contador should be fine in July. 3. While it might be a bit early to say so, I’m starting to think Tejay Van Garderen is the USA’s next great stage race hope—and not in a Tom Danielson kind of way either. Van Garderen’s proven himself as an amateur in Europe, and finished 2nd in another important French stage race last season, the Tour de l’Avenir. Van Garderen seems unfazed when racing in a country where just about every GC leader’s jersey is yellow. With a terrific organization backing him, look for Van Garderen to steadily progress through the ranks—he’ll get his first shot at a Grand Tour in this autumn’s Tour of Spain. 5. As for Rabobank’s Denis Menchov—his Alpe d’Huez performance notwithstanding—I think it’s safe to put him back on the list of favorites for July—unless there’s rain during the Prologue. 6. Other impressive rides were registered by youngsters Romain Sicard, Branislav Samoilau, and Thibault Pinot from Euskaltel, Quick Step, and FDJ, respectively. None of the three is likely to be riding the Tour this summer, but their performances bode well for the future. 7. It’s too bad that Heinrich Haussler and Edvald Boasson Hagen had to wait until Sunday to win their first major races of the season—it’s good to have them back. 8. In other news, it’s looking like the organizers of the Tour de Suisse gave Fabian Cancellara quite a gift in creating this year’s parcours. Today’s Stage 3 was effectively the only “summit” finish of the weeklong Tour—if you consider a 2-kilometer climb with an 11% grade climb to the finish. The event’s Queen Stage is Thursday’s Stage 6, a 213-kilometer slugfest featuring one first category and two hors categorie ascents. But don’t get your hopes up—the stage finishes after about 15 kilometers of descending following the HC climb of the Albulapass. The stage will test Cancellara’s climbing legs, but with the strongest team in the race and a long-ish ITT on the final day, it might be hard for the competition to deny him another win in his home tour. That said, my pick for the overall title—Tony Martin—just took the leader’s jersey today. If he can gain more time between now and Sunday’s ITT, he’s the one rider capable of limiting his losses enough to unseat Cancellara from his throne. 9. In terms of the Tour de France, several men bear watching in Switzerland this week. For instance, Stage 1 gave us our latest chance to see if Lance Armstrong is ready to challenge the favorites at this year’s Tour. If Saturday’s 7.6 kilometer ITT is any indicator, the answer is “no”. Lance finished 44th—almost half a minute down. Even Andy Schleck beat him. And yes, there’s a difference between saying Contador’s defeat is nothing to get worked-up about while stating that Armstrong’s is cause for concern. Contador is at about 90% of his top fitness, I reckon—the difference might have been enough for him to win the Dauphiné’s long ITT or perhaps drop the rest on Alpe d’Huez. Had Armstrong finished a few seconds off the pace Saturday, we would consider him on-track for the Tour as well. But he didn’t. No matter how you slice it, losing 29 seconds over 7.6 kilometers is just not something we have come to expect from a Tour contender at this point in the season—especially one known for his time trialing. In Lance’s defense, there was rain, and several other favorites recorded poor times including David Zabriskie, Luis Leon Sanchez, and Christian Vande Velde. 10. Last but not least, what do you make of today’s announcement of the teams invited to the Vuelta? Is Radio Shack starting to feel the fallout from Landisgate? And what does Vacansoleil have to do to earn an invitation to a grand tour? 11. In closing, I’ll leave you with this. (Warning: it’s graphic.) Thoughts? Have a great day—and share your comments below. What did you take away from the Dauphiné? What do you think about this week’s Tour de Suisse? This entry was posted in Musette and tagged lance, racing, tour of switzerland. Bookmark the permalink. Can anyone tell me how many DNF and DNS' Cervelo's João Correia has notched up thus far? 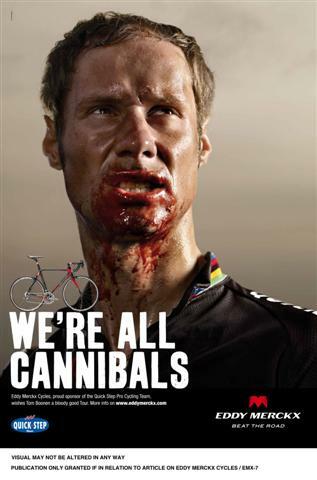 Lots of flak over that ad – but – every biker in the world has seen it. Testing the "no such thing as bad publicity" theory. Good summary. I would have thought Contador wouldn't have had too much trouble with Brajkovic, even at 90%. Not convinced something isn't up with that. LA losing that kind of time over 7+ kilometers is a huge cause for concern. About the only way he gets a pass is if he was being careful on the wet roads. The Vuelta announcement is incredible. Is this payback for Valverde, fallout from Landisgate, or more probably, retribution for last year's treatment of AC? Even w/o LA, the team that would be racing for RS was pretty strong, and capable of challenging for the win. Talk about bush league. People are being awefully surprised over Brajkovic, but look at his results this year and last in week long stage races, there are quite a lot of top tens and in most of these races he did domestique work. With the back-up off a team he could surely reach that higher level that would result in a win. And considering he said in Slovene media after last years Giro ITT that he didn't even go full out and he still placed third in that, for him to win a Time trial like the one in Dauphine doesn't seem that far-fetched. LA does not look good right now, but my guess is that if not for the rain, he would have felt easier about pushing harder in the last three kilometers or so. Having said that, he was off the pace at the intermediate check over the course's only climb by more than 20 seconds. Could be bad form, could be lack of racing as well. Lots of ifs still for LA. Cavendish should be tossed from the Tour de Suisse for his actions yesterday. He has always been unsportsmanlike in his speach although this just takes it to another level. Whit, your thoughts on the crash, but foremost the internal justice and riders protests?